I was recently out on one of the Forest Service trails north of Patagonia trying to locate several old mines to match up with photos that had been taken in 1909. The southern end of the Santa Rita Mountains are quite rugged. The road that the border patrol guy pointed out, like most of them down there, was definitely 4WD. As I made my way, there were a variety of mine dumps, old adits and concrete foundations to be seen-- Those mines were very active in the early 1900's. Today, there is nothing happening at all. The info about the road was correct in that there were rough sections--some were rocky and others were quite loose. I do not air down while on backcountry trails, so I probably have a few more issues than those who do. I engaged the locker on my Tacoma several times. In about 5 miles, the cabin appeared. It sits in quite a large clearing. The building was not one that I knew about or had ever been to. It is a simple two room affair that appears to be pretty much weathertight. There is a basic woodstove , several bedframes and a table. I do not know the origin or purpose of the cabin. Very often, old cabins have a register with info about the place. I did not see one of those in this old cabin. 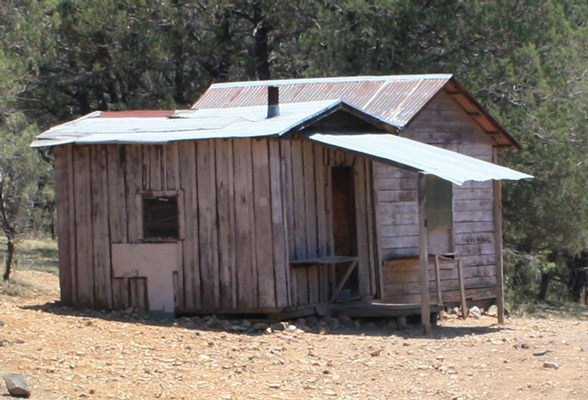 If I were to guess what its original function was, I think that I would say--ranch line cabin. There are no signs of mining activity close by. There are quite a few stumps of large trees that were cut down a very long time ago. The cabin seems to get some use and some upkeep. It is located in a nice spot and the road getting to it is challenging.